On RCS enabled devices supporting RCS Chatbots, simply activate the service when prompted, for tablets and PCs, download the app from a link provided to you by your operator. 3.You're on with Home Stick! Your home automation devices will be accessible through an RCS Chatbot. Easily switch between communicating with contacts under the messaging tab, to communicating with your devices under the bots tab - it's the same app as your RCS messaging service on your smartphone! Operators offer logo/color branded USB sticks which connects to an HBR, enabling either ZigBee, Z-Wave or Bluetooth with LTE-M based services. 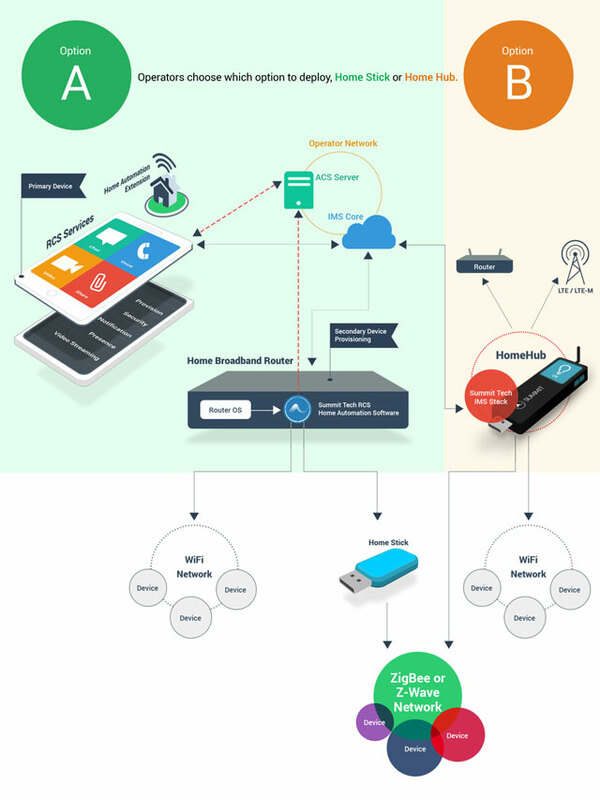 Summit's RCS IoT Home Automation solution is available either through operator enabled RCS Home Broadband Routers or through the Summit RCS Home Hub connected via 5G/LTE or Wi-Fi, including support for Cat M1 and NB-IoT. The Summit RCS Connected Home solution brings together telecom grade communication infrastructure and industry standard home automation protocols elevating Cellular IoT to the next level. 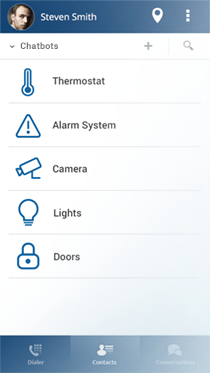 Alternative home automation solutions typically use best effort or over-the-top technology for reasons it being initially simpler to distribute as downloadable apps, and can be developed independant to that of standards-based technology, resulting in a faster time to market. On the flip side, such services often result in proprietary, closed, black box solutions, limiting interoperability. Addtionally, it can be challenging for black box providers to scale and interoperate with related services as they often include proprietary components for digital identity, content streaming, etc. 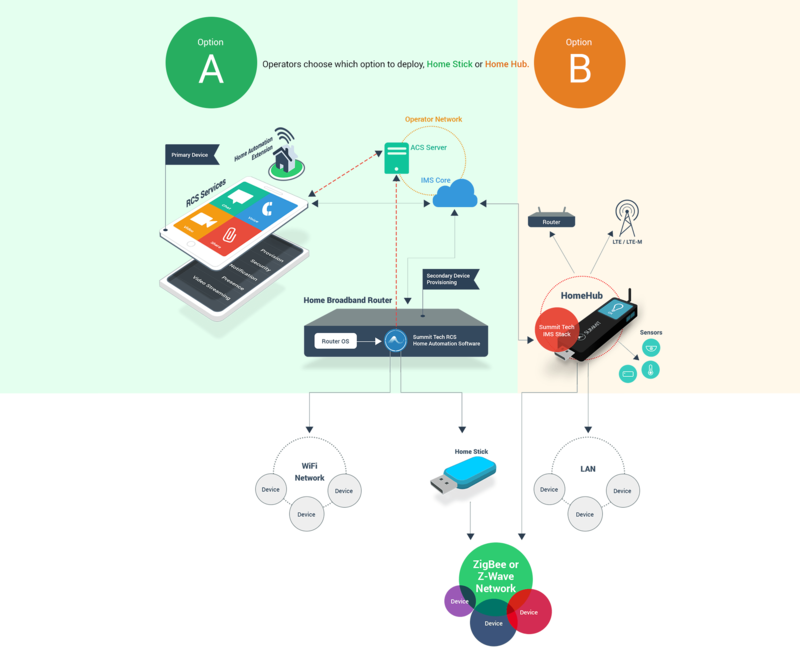 Summit RCS Connected Smart Home leverages an operator's existing IMS deployment through Rich Communicaton Services, enabling operator grade provisioning, security, voice and data services, ensuring customers experience quality of service through a unified communication provider. Summit RCS Connected Smart Home is value added service to the carrier-grade IP services being deployed by MNOs globally. IMS/RCS services offered by operators are designed to scale and operate over regulated networks which provide QoS (Quality of Service). By extending RCS to support connected living functionality through Cellular IoT, Summit RCS Connected Smart Home leverages IMS-based services such as digital identity through Mobile Connect, Provisioning, Capability Discovery, Security, Notification, Location and rich media capabilities supporting voice, video and data sharing sessions. 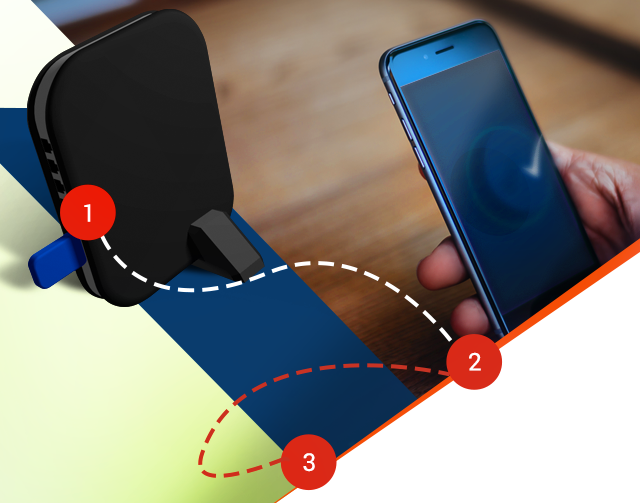 From a customer's perspective, simply Click, Tick and connect with Home Stick.